Expenses relating to medical expenses have been expanded to include service animals and can be claimed for non-refundable tax credit. You should also be aware that you can claim for yourself, your spouse or common law partner and any dependent children under the age of 18. As of January 1, 2018, in addition to applying to certain types of income of a child born in 2001 or later, TOSI may now also apply to amounts received by adult individuals from a related business. Any fees paid for specific advice about your investments or for tracking your income from investments. Any fees paid for management of your investments, except administration fees paid for your registered retirement savings plan or registered retirement income fund. Interest you paid to borrow when borrowing to invest for investment income only except if investment income is considered capital gains. Insurance policy loan interest you paid in 2018 to make income. To claim this amount, the insurance company must complete Form T2210 before your tax return deadline. 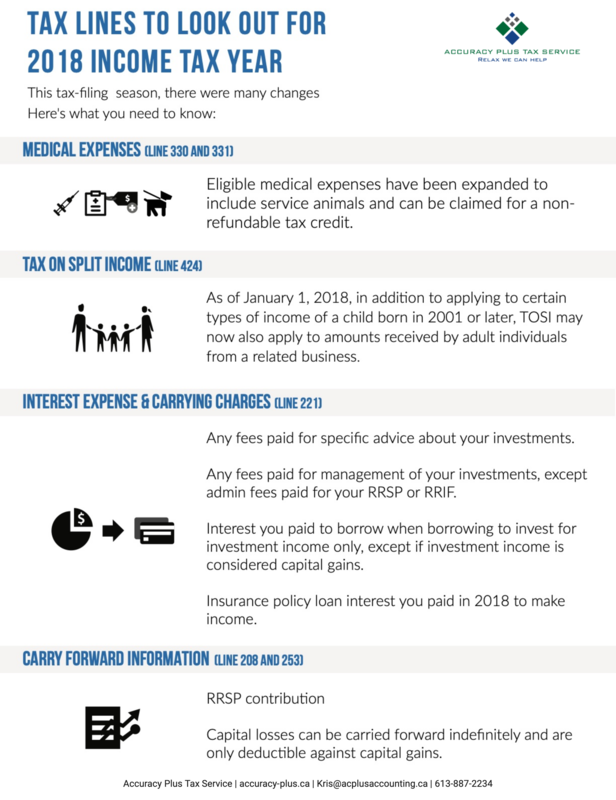 If you are not deducting all your RRSP contributions you made in 2018 and the beginning of 2019, your unused contributions can be carried forward. Generally, if you had an allowable capital loss in a year, you have to apply it against your taxable capital gains for that year. If you still have a loss, it becomes part of the computation of your current year net capital loss. You can use a current year net capital loss to reduce your taxable capital gains in any of the 3 preceding years or in any future year. Capital losses can be carried forward indefinitely and are only deductible against capital gains. As of January 1, 2018, the first-time donor’s super credit has been eliminated. This article and infographic are for illustrative purposes only. You should always seek independent legal, tax, financial and accounting advice with regard to your situation.